In July of 2018, Commonplace officially joined the Point Breeze community. We’ve always been in love with the neighborhood and were excited by the opportunity to open a shop in the space formerly occupied by Make Your Mark Artspace & Coffeehouse. Make Your Mark had served the community for many years, and we were honored to carry on the tradition with our seventh retail location. The launch of Commonplace Coffee in Point Breeze was the result of a beautifully orchestrated team effort lead by shop manager, Dave Smallhoover. Dave had previous experience operating a coffeehouse and had also become part of the Commonplace family through his time working at our Mexican War Streets shop as well as the roastery. Friends and colleagues know Dave for his desire to promote awareness and education around sustainable coffee sourcing and production by building meaningful relationships with coffee farmers and producers at origin. Dave’s heart and vision for coffee and building community is evident when you walk into the shop and experience the care his team displays when serving guests and practicing the craft of coffee. The hallmark of the Point Breeze shop is the garden patio located in the back, where guests are invited to relax and enjoy the environment with friends and pets or take a few moments to themselves. It is a great place to spend the morning or wind down in the afternoon. 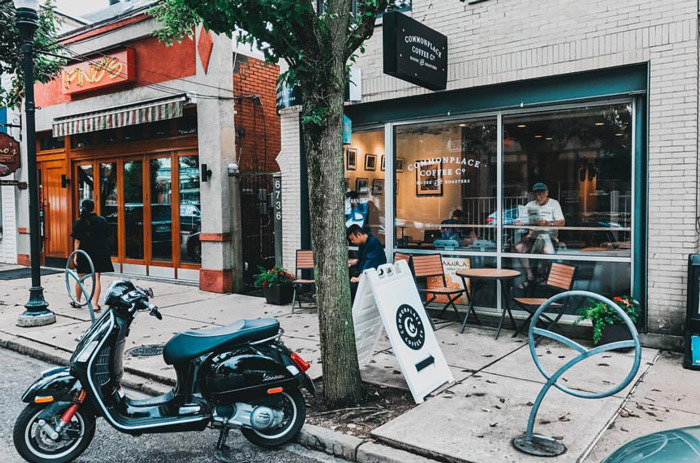 Whether it is grabbing a morning drip coffee or enjoying an afternoon capp on the pat, Commonplace is excited to be a part of the Point Breeze community.